Votorantim Metals Canada Inc., a wholly owned subsidiary of Votorantim Metais which is Brazil's second largest mining company, provided further option to ELN to purchase an additional 15% in the project for a combined total of 50%. October 2, 2012, Vancouver, Canada; El Nino Ventures Inc. ("ELN" and the "Company") (TSX.V: ELN; OTCQX: ELNOF Frankfurt: E7Q) is pleased to announce high-grade assay results for an additional ten holes from the most recent round of drilling at the Murray Brook polymetallic massive sulfide deposit, Bathurst Mining Camp, New Brunswick. The 2012 drill program consisted of infill and delineation drilling. The 2012 drill program was completed in June. Ninety seven vertical holes were drilled for a total of 18,470 metres. MB-2012-138 was drilled to infill gaps in the previous drilling (Figures 1). Hole MB-2012-138 was drilled in the northern side of the Western Zone and intersected 45.4 metres of 8.49% zinc, 0.18% copper, 4.58% lead, 0.59 gpt gold and 152.2 gpt silver from 179.6 metres down hole, including 11.0 metres of 13.7% zinc, 0.20% copper, 9.60% lead, 1.10 gpt gold and 269.7 gpt silver from 214.0 metres down hole (Table 1). Holes MB-2012-141 to 143, 146 and 148 were drilled to better delineate the western boundary of the Western Zone and Holes MB-2012-144, 145, 147 and 149 were drilled to delineate the northeastern boundary of the eastern Zone (Figure 1). Western Zone appears thicker and more Zn-Pb-Ag rich where Eastern Zone is thinner and more Cu-Au rich. 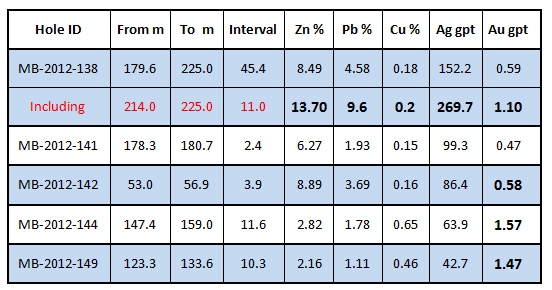 Hole MB-2012-144, drilled in the northeastern side of the Eastern Zone intersected 11.6 metres of 2.82% zinc, 0.65% copper, 1.78% lead, 1.57 gpt gold and 63.9 gpt silver from 147.4 metres down hole (Table 1). Drill holes MB-2012-144 and MB-2012-149 in the Eastern Zone, and Drill Holes MB-2012-137 and MB-2012-146 to MB-2012-148 in the Western Zone were drilled in areas that were not drilled previously and are external to the resource defined by the 2012 NI 43-101 compliant resource estimate (Figure 2). These holes as well as all other holes drilled in 2012 will be included in and will augment an updated National Instrument 43-101 ("NI 43-101") mineral resource estimate slated for completion in the last quarter of 2012. Note: Intervals approximate the true width of the mineralized zone. 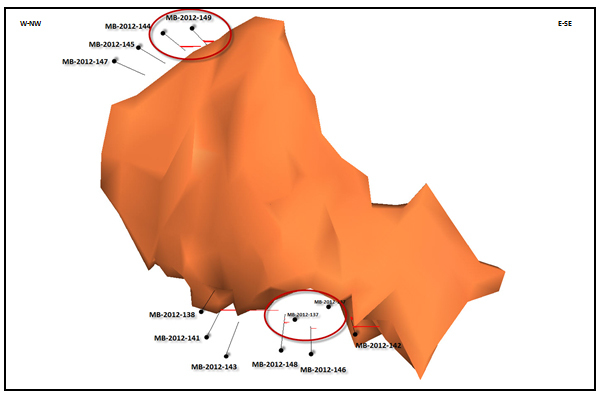 Drill holes MB-2012-143 and MB-2012-145 to MB-2012-148 were drilled to delineate the boundaries of the deposit and did not return economically significant results. 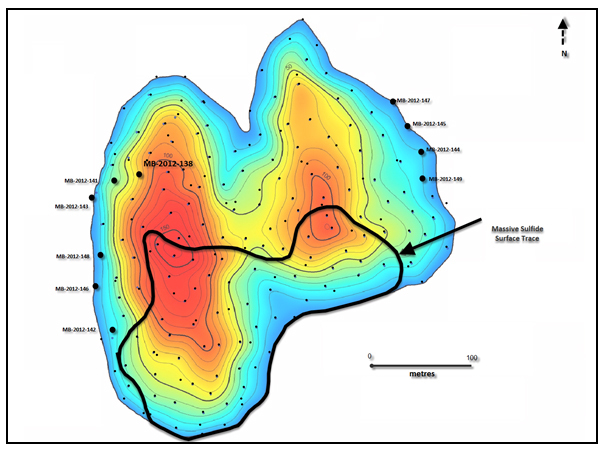 The 2012 drilling program was very successful in delineating the Murray Brook Massive sulfide deposit. A $3 million exploration budget was approved for the 2012 exploration drill program. It includes $2.5 million for drilling measured resources at the Murray Brook deposit and $500,000 for exploration of the Murray Brook and Camel Back properties, both of which are covered by the option agreement with Murray Brook Minerals. In addition to exploration activities a metallurgical tests of a 3 tonne bulk sample of drilled massive sulfide material from the Murray Brook deposit is currently underway. Three HQ diameter diamond holes were drilled to provide sample materials for metallurgical tests. The test-work is focused on determining potential metal recoveries based on a recommended metals recovery process flow sheet which, subsequently, will form the basis for a small scale metallurgical pilot plant program. Metallurgical results, along with an amended resource estimation incorporating the 2012 drill results, will form the basis of a Preliminary Economic Assessment (or Scoping Study) study planned for completion in Q1 2013. Should the PEA be positive it is anticipated the project will enter a prefeasibility stage and in 2013 work will include some additional resource definition drilling, drilling to obtain a 30 -- 40 tonne sample for metallurgical studies, geotechnical drilling and environmental assessment studies. Please see Project page. 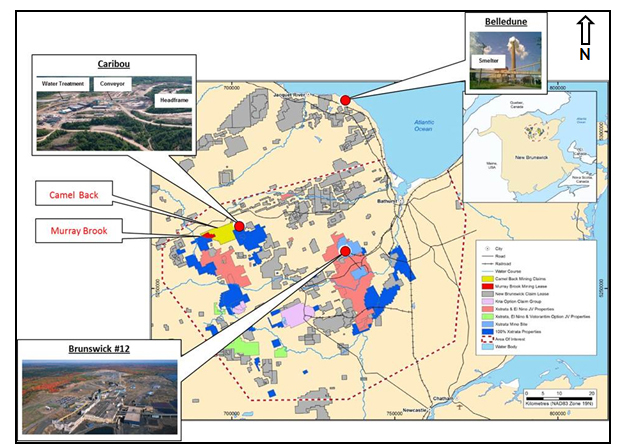 On September 6, 2012 ELN announced that Murray Brook Minerals Inc. ("MBM") has been given formal notice by both ELN and Votorantim Metals Canada Inc. ("VMC") that a 70% earned interest in the Murray Brook polymetalic project, Bathurst, New Brunswick has been completed. Under a purchase agreement signed by VMC on August 28, 2012 with MBM and Murray Brook Resources Inc. (collectively the owners), VMC acquired the right to purchase the additional 30% of the Murray Brook Project from the owners. ELN has been provided the option to purchase an additional 15% in the project for a combined total of 50% (35% +15%). Although the terms of the Participation Agreement provided for a three-year period to earn the initial 50% and two years to earn the additional 20%, ELN and VMC completed their earn-in in less than 18 months. Encouraging drill results and a robust NI 43-101 resource estimation accelerated the exploration and development programs and is a testament to Votorantim's commitment to aggressively advance the project (see ELN press releases dated: February 28 and May 17, June 5, June 27, July 17, July 30, August 14 and August 28, 2012).). The Murray Brook project is a polymetallic, massive sulfide deposit. Historically, the deposit is the fifth largest in the Bathurst Mining Camp, New Brunswick. The Murray Brook property is located 60 km west of Bathurst. It is supported by excellent infrastructure, including paved roads, grid electricity and communities to provide goods, services and skilled labour (Figure 3). To date, more than 28,000 metres of drilling has been completed with encouraging results. In February 2012, a NI 43-101 resource estimation was announced (see news release). The technical report is filed on SEDAR.com and also available on ELN's website. Figure 2 -- View looking down at the 3D model of the Murray Brook deposit (Orange). The red line illustrates the areas outside the 2012 NI 43-101 compliant resource estimate1 . 1 Figures 2 is provided for illustrative purpose, it is not to scale and have no demonstrated economic viability. Murray Brook Minerals Inc. is a privately owned mining exploration company with mineral properties in New Brunswick, Canada. It is owner of the Murray Brook deposit, situated on Mining lease 252 (352 Ha), which is one of the largest massive sulfide deposits in the Bathurst Mining Camp. It is also owner of the Camel Back Property consisting of 215 claims (3,440 Ha) and the Legacy Copper-Silver project which consists of 23 claims (564.6 Ha). Votorantim Metals Canada Inc. is a subsidiary of Votorantim Metais; a company that is part of the Votorantim Group that was founded in Brazil in 1918 operates in over twenty countries and has forty thousand employees. Votorantim Metais is one of the five main zinc manufacturers worldwide, the main electrolytic nickel manufacturer in Latin America, and one of the Brazilian leaders in the production of primary aluminum.